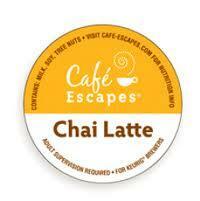 Long Description: Cafe Escapes Chai Latte. Mesmerizing aromatics with flavors of black tea and exotic spices, smoothed by a splash of milk and sugar. 24 Kcups per Box.